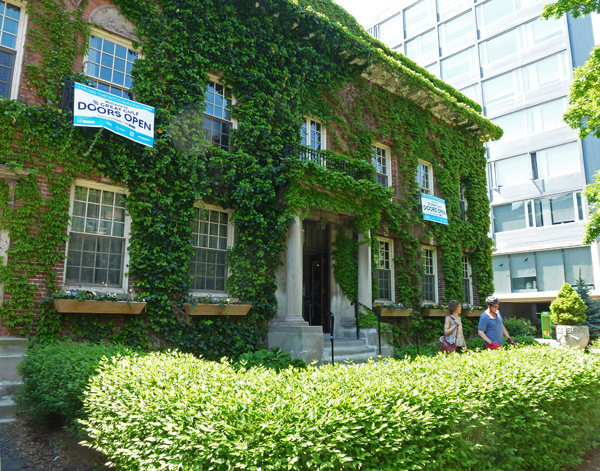 This is the Faculty Club at U of Toronto and as you can see from the signs it took part in the Doors Open event a couple of weeks ago. This Georgian Revival building was constructed in 1920 and was owned by various clubs in the city until being taken over by the faculty union and turned into the Faculty Club which is also open for membership to alumni and graduate students as well as community members. It was interesting to see the inside of it since it has several lovely event rooms as well as a lounge, pub & great patio. I'll show you one of the rooms tomorrow. Wow, look at all that ivy. Pretty building. Enjoy your day! I love all the vines on the sides of the building. A whole lot of ivy. That's a great thing about Doors Open, getting to see inside places like this. Something so lovely about an ivy covered building! Well, I just have to say that I love the ivy on the front of the building!! ...lovely, but I will never understand why people grow ivy on buildings, it's not good for them. The building is at its loveliest during the summer months, I'd guess. All that greenery is quite lovely. Is it possible for me to enroll at the Univ. of Toronto? What a beautiful structure and I imagine it is a favorite place for the faculty, alumni and grad students. No problem with a green facade here. Looks great. This is some greenery! The building itself is lovely too, but oh the added nature just makes it even more special. When I see a faculty club, it makes me want to grab a tray and take orders. I waited on table during college in a faculty club.